Wouldn’t it be great if we never had to worry about the earth’s soils constantly expanding and contracting? The reality, though, is that changes in temperature, excess moisture and drought conditions force soils to adapt on a regular basis. Over time, such movement creates uneven surfaces that often result in dangerous trip hazards at your residential or commercial space. Whether you’re a private property owner, commercial property owner, management company, or municipality, you have a responsibility to maintain a safe space. This means staying ahead of and eliminating trip and fall hazards altogether. 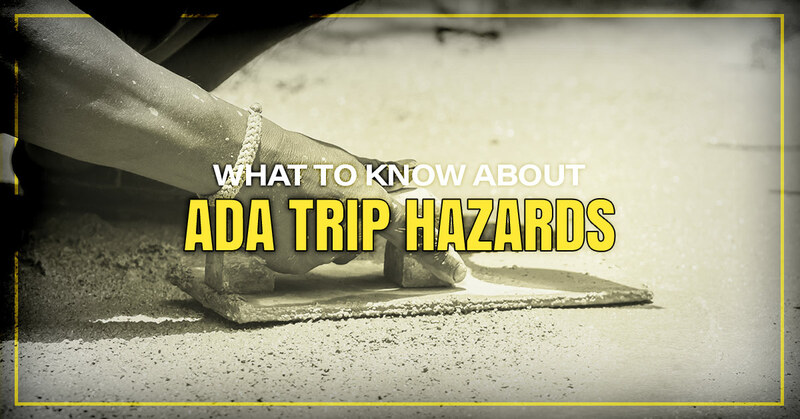 Keep reading as we explain the ins and outs of ADA trip hazards. The Americans with Disabilities Act prohibits discrimination and ensures equal opportunity for those with disabilities in employment, state and local government services, public accommodations, transportation, and commercial facilities. We’re going to focus specifically on public accommodations and commercial facilities in this post. As a refresher, these spaces must be accessible to people with disabilities. Settled or sinking concrete not only creates a trip hazard for the general public, but it also makes the area impassible for those with impairments. Liability issues could come into play should you fail to address these sorts of concrete trip hazards. So what’s the next step if you find some sort of concrete trip hazard on your residential or commercial space? First, keep in mind that the ADA defines a trip hazard as any vertical change over a ¼ inch at any joint or crack. Obviously, an area that has significant foot traffic raises trip risks. Let’s go back to the aforementioned liabilities. Those who are found liable for failure to maintain safe pedestrian areas may incur expenses such as settlements, damages awarded, attorney’s fees, and impact on insurance rates. After all that, you must still repair the concrete. There are several options to deal with trip hazards that result from settled or sinking concrete. Some local concrete services might try to sell you on invasive, short-term approaches such as mudjacking. Frankly, though, you shouldn’t have to wait weeks for the treated area to be back in service, only to pay for repairs a second time down the road. It’s no secret what makes Concrete Leveling Technologies the premier choice for those in Austin. Family owned and operated, we go above and beyond to meet your concrete repair needs. You can count on us to provide effective, long-term solution at a price that won’t break the bank. So how exactly do we approach concrete stabilization differently? For one thing, we use polyurethane foam. As the foam reacts and expands, the slabs are raised back to where they should be. There’s no need to worry about the environmental impact with Concrete Leveling Technologies. The products we use are eco-friendly, meaning the foam won’t break down over time or release harmful chemicals into the soil. When it comes to concrete leveling in Austin, Concrete Leveling Technologies has you covered.